Toss 2 cups of the blueberries with ½ cup of the sugar, flour and cinnamon; sprinkle mixture out evenly in chilled tart shell. 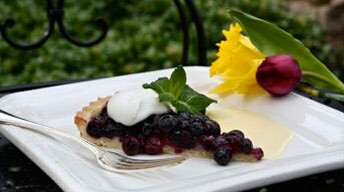 Bake for 40 minutes, or until pastry is browned and crispy and blueberries are fully cooked. Transfer to cooling rack. Toss the remaining 2 cups of blueberries with the remaining sugar. Gently press into the cooked tart. Allow to cool before serving. Combine flour, sugar and butter in food processor; pulse until butter is fully incorporated. Add egg; mix until dough just comes together. Transfer to lightly floured work surface. Roll dough out to 1/4-inch thickness, and line an 11-inch tart pan. Note: there will be some leftover dough.